The New York Times has a good piece this morning examining the major obstacle in switching to wind power: the outmoded electricity grid. What's needed is an electricity transmission superhighway, says one Federal Energy Commission rep. US voters want solar and wind energy, but that doesn't mean they are against drilling for more oil, according to a Wall Street Journal-NBC News poll released this week. "When the question was asked another way, 61% of respondents chose 'developing alternative energy sources' as the step that should receive the most emphasis from policy makers." "Asked about building more nuclear plants, 53% said it was a step in the right direction. Thirty-one percent said it was a step 'in the wrong direction.'" Congress will come back to Washington in a few weeks and head into a debate about continuing alternative-energy tax credits and lifting the 27-year drilling ban off US coasts. The poll suggests a need for a balanced approach. Hope Congress is listening. You may want to read this book by starting with Part II. Either that or make sure all the knives are locked away so you won't slit your wrists during Part I.
Lester Brown has his facts straight and uses them liberally, but reading about how dire is the current situation on the Earth leaves you feeling hopeless. Increasing shortages of water, rising CO2 levels, food security, health, education, and natural systems under stress. What can we possibly do to change this for the better? Luckily, Brown pivots after the first 127 pages and devotes the rest of the book to solutions. "There are many things we do not know about the future," Brown writes. "But one thing we do know is that business as usual will not continue for much longer...Will the change come because we move quickly to restructure the economy or because we fail to act and civilization begins to unravel?" That is the critical question of this book. Can we move fast enough and for the right reasons? Brown, the founder of Worldwatch and the Earth Policy Institute, has been promoting a sustainable future for over 30 years. 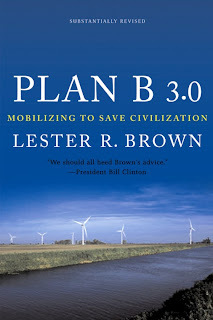 He includes recommendations for eradicating poverty, stabilizing population (through education and contraception), restoring natural systems, feeding the projected 8 billion we are likely to see in this century, and shifting to greater energy efficiency and alternatives. And he budgets out the necessary costs, estimating Plan B will take an additional annual expenditure of $190M, "roughly one third of the current U.S. Military budget or one sixth of the global military budget." Brown concludes: "The choice is ours -- yours and mine. We can stay with business as usual and preside over an economy that continues to destroy its natural support systems until it destroys itself, or we can adopt Plan B and be the generation that changes direction, moving the world onto a path of sustained progress." From New Scientist: "Self-recognition, once thought to be an ability enjoyed only by select primates, has now been demonstrated in a bird. "The finding has raised questions about part of the brain called the neocortex, something the self-aware magpie does not even possess. "In humans, the ability to recognise oneself in a mirror develops around the age of 18 months and coincides with the first signs of social behaviour. "So-called 'mirror mark tests,' where a mark is placed on the animal in such a way that it can only be observed when it looks at its reflection, have been used to sort the self-aware beasts from the rest. "Of hundreds tested, in addition to humans, only four apes, bottlenose dolphins and Asian elephants have passed muster. "Helmut Prior at Goethe University in Frankfurt and his colleagues applied a red, yellow or black spot to a place on the necks of five magpies. "The stickers could only be seen using a mirror. Then he gave the birds mirrors.Catch a glimpseThe feel of the mark on their necks did not seem to alarm them. "But when the birds with coloured neck spots caught a glimpse of themselves, they scratched at their necks - a clear indication that they recognised the image in the mirror as their own. "Those who received a black sticker, invisible against the black neck feathers, did not react. "The authors suggest that self-recognition in birds and mammals may be a case of convergent evolution, where similar evolutionary pressures result in similar behaviours or traits, although they arrive at them via different routes. "De Waal agrees: 'Magpies are known for their ability to steal shiny objects and to hide away their loot. It's not too far-fetched that a master thief like a magpie has that perspective-taking ability,' he says, referring to the idea that the birds have a 'theory of mind.'" But do they care what they look like in the morning? "How do we begin reorganizing the industrial economy?" Umair Haque asked in his Edge Economy essay "A Manifesto for the Next Industrial Revolution." Haque answers his own question: "By using markets, networks, and communities to alter the way resources are managed: to weave a fabric of incentives for sustainable growth and authentic value creation into the economy – a new economic fabric that's meaningful to people." What would it take to infuse new DNA into the way green energy is financed? Can we redraw the boundaries of value creation in the 21st century? Can we expand the access to participation in this space? Can we create a company that is based on the values of integrity, openness, transparency, and "a fierce embrace of what's good" (as Haque writes elsewhere)? Can we create a company that develops incentives for people to reorganize and manage resources in a way that reduces the barriers to entry for most people? I'm becoming obsessed by these questions and am trying to create a response to Umair's challenge. I hope that what I'm working on with a few very smart people will help reduce or eliminate the "clear, durable, structural barriers to efficiency and productivity" in this space. The pursuit of answers to these questions is one of the reasons I'm leaving Ashoka at the end of this month. I need to focus my time and energy on trying to explode the boundaries of value creation and unlock the new green economy. Call me a fool, wish me luck – or come along for the ride. I know a lot of people who don't get Twitter, including some who are near and dear to me. Most think it's an unnecessary distraction; some actually think it's evil. I used to think the former, but then I became addicted. After many months of using it, I realized the best answer to Twitter's simple question, "What Are You Doing?" is NOT, "Having a sandwich" or "Drinking my 3rd cup of coffee." 3.) to wrestle with business problems, the answers to which may already be out there in the Twitterverse. Recently, a number of us are using Twitter to muse about the rise and fall (mostly fall) of our stock portfolios and to gauge what others are thinking about companies we are interested in. StockTwits scans your tweets (as long as they contain a stock ticker preceded by $, such as $FSLR) and automatically indexes and displays them with a chart of the ticker. Now, two of my favorite addictions, er distractions, Twitter and WallStrip have come together, trying to answer the question, "What ARE you doing?" Shout-outs to Howard Lindzon and Soren Macbeth, who got me into StockTwits early -- another great distraction, er tool. Four Sonoma and Napa County, California, wineries are trying to power their operations with renewable energy. Now you can help them by loading the "Green My Vino" application on Facebook. "Green My Vino" allows Facebook users to promote environmental change in the wine business. The application, developed by Village Green Energy, creates three free gifts in Facebook, representing 1, 5, and 10 minutes of renewable energy. When a user gives the gift, Village Green Energy purchases an equivalent amount of renewable electricity from a wind farm or solar array on the Facebook user's behalf, according to Village Green. If Facebook users pass 10,000 minutes, the first winery will convert to green power. Seems like a tall order, but it is based upon the success of other applications with high volume of use and effectiveness, such as the Lil' Green Patch, which helps save rainforest as friends give each other cartoon plants. To date, according to the application developers, the Lil' Green Patch community has saved 29,259,567 square feet of Rainforest by using sponsorship revenue from advertisers to make donations to the Nature Conservancy's Adopt an Acre program. The first four wineries to participate in Green My Vino are Iron Horse Vineyards, Girard Winery, Windsor Vineyards, and Windsor Sonoma. Village Green intends to recruit additional wineries once the original four have converted. "We jumped at the opportunity to participate in the application," said Pat Roney of Windsor Vineyards. "'Green My Vino' gives the community the opportunity to interact with businesses and make their voices heard. When people participate in the application, they're telling us that clean energy is a priority for them, and we'll make supporting renewable energy a part of our commitment as a business." Village Green Energy enables households and businesses to purchase renewable energy from wind farms, solar arrays, and other renewable technologies through the purchase of Renewable Energy Certificates (RECs), the legal rights to renewable power. 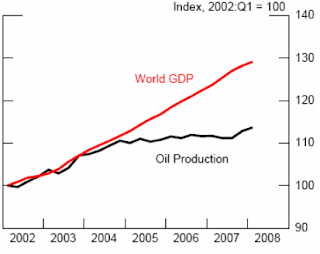 Is the high price of oil due to oil speculation? Opinions differ on the impact of investors looking to make a buck on limited supplies and rising demand. Some point out that while the White House would like to blame supply shortages, that's the same argument given back when Enron was fleecing California by manipulating energy prices. "Many members of the media have forgotten how in 2001 the White House deflected any blame for California's suddenly stratospheric electrical costs away from their Houston friends," wrote Ed Wallace in his Business Week Viewpoint piece on 27 June 2008. "Likewise, our Energy Secretary has a real problem discussing issues with facts. Like a broken record, he continues to maintain that in no way has speculation had anything to do with today's high oil prices. No, to hear Sam Bodman tell it, they are now and always have been caused by too many buyers chasing too few barrels of oil." But, as our friends at The Oil Drum (TOD) reported last week, a recent report by the Commodity Futures Trading Commission (CFTC), "threw cold water on the recent rhetoric in Congressional testimonies and television commentary that high oil prices are caused by investment speculators." "During this same period," according to the report, "activity on the crude oil futures market – as measured by the number of contracts outstanding, trading activity, and the number of traders – has increased significantly. While these increases broadly coincided with the run-up in crude oil prices, the Task Force's preliminary analysis to date does not support the proposition that speculative activity has systematically driven changes in oil prices." Now, we'll believe anything Julie tells us (except that she'll call when she says she will), but the fact is, the run-up in oil prices is probably a bit of everything: less supply, higher demand, speculation, and good old-fashioned free-market profiteering (not that there's anything wrong with it...).